Sandy Key’s beaches are forever protected by the neighboring National Seashore Preserve. If you prefer your walks on the beach, solely in the company of the sea gulls, Blue Herons and sea shells, then Sandy Key is the place for you. Sandy Key is located on 800 feet of Beach Front. This ground floor unit has 1219 SF of living area and a 200 SF beach front balcony. Walk directly from your private balcony to pools, hot tub, grilling areas and beach. Ceramic Tile throughout Living, Dining, Foyer, Kitchen and Baths. Bedrooms are carpeted. Electronics include 46" TV, DVD, VCR in Living Room and 32" TV, DVD in both Bedrooms. For the past 8 years you have been always friendly, always helpful, and you guys go out of your way to make us feel welcome. Thanks so very much. John A. This year was another great stay at Sandy Key where we have stayed the last 8 years. This year we ask about other properties and/or units that might handle a larger group of our family and you guys went out of your way to arrange for us to tour a different unit at a different property. Outstanding customer service. Thanks very much. John A. 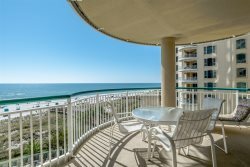 Excellent, fast and friendly response every time we have interacted with Perdido Realty over the last 8 years of renting vacation condominiums. Sandy Key is a great property with easy access to all the busy touristy places, but off the beaten path enough to feel very private and layed back. The staff at Perdido Key Realty was great! We checked out early because of Tropical Storm Cindy but the time we had staying at Sandy Key was great! The condo was everything we needed and more! The complex was clean and the staff was very nice. The beaches are clean and quiet, which is what we wanted for our family vacation! We will definitely be returning!